I have been spending a fair amount of time recently trying to understand the streetcar city we once had. Say in 1929 or so. Why, you might ask? Well, for a couple of reasons. First, the routing of the streetcars of so long ago is nearly identical to the routing of today’s bus system. This may seem counterintuitive to some who realize how much this place has changed in the last 80 years or so – sprawl has emptied the city, changed where we live and work, vaporized downtown retail and entirely changed our patterns of urban life. But the routes, right down to the route numbers for many routes, are intact. More about this later. And then I got to wondering about how it was to move around the city in those days. 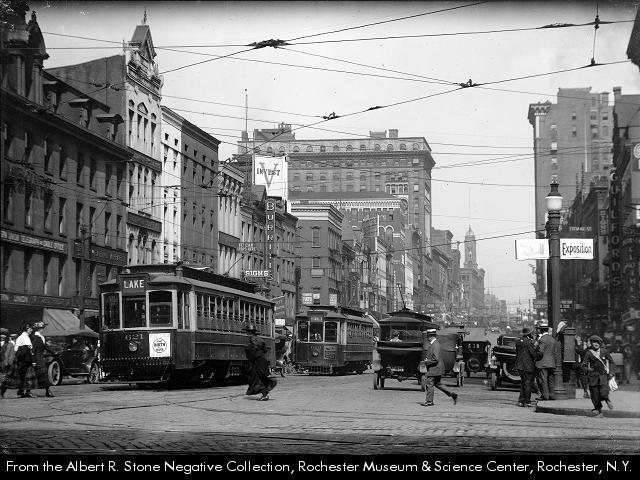 In 1929 we had subway, streetcar, bus, and trackless trolley (electric buses running on power from overhead lines) in addition to interurbans and long distance passenger rail. Today we have bus. And our cars, endlessly our cars. The solid lines are streetcars, the dashed lines are buses, and the subway is a doubled line with dashes inside. There were something like 10 bus lines and about 15 or more trolley lines. Remember this: in those days the city was nearly twice as populous in nearly half the land. There was not yet a large non-city population (regional population). Downtown was, well, downtown: bustling, filled with jobs and retail and entertainment – the destination. The map shows so many routes going there because that’s where everyone wanted, and needed, to go. 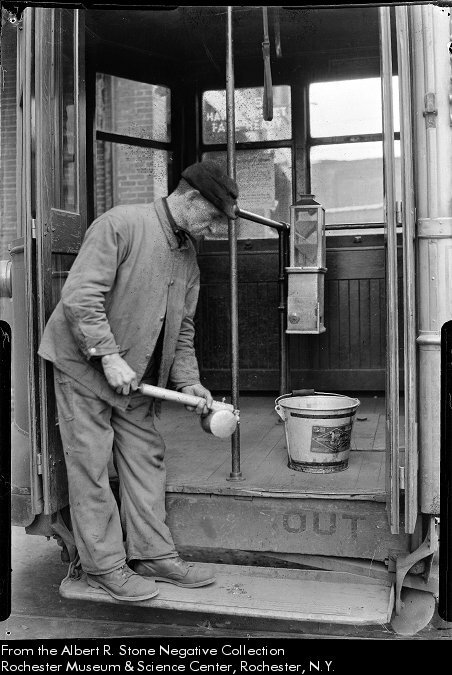 The fare was a dime – about $1.25 today – and there were transfers so that you could change streetcars, or change modes, from streetcar to bus to trackless trolley. (Today there are no transfers – it’s a buck a ride, and another buck on the bus you have to transfer to). 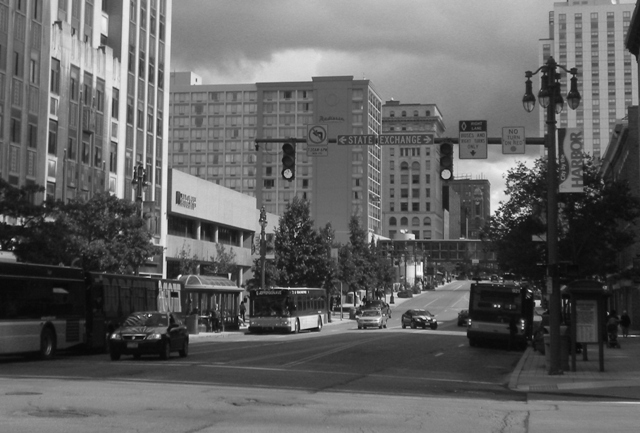 In fact the streetcar transfer was invented here, by a man named John H. Stedman, 1843 – 1922, in 1892. Notably, Stedman also invented the fuzzy pipe cleaner. 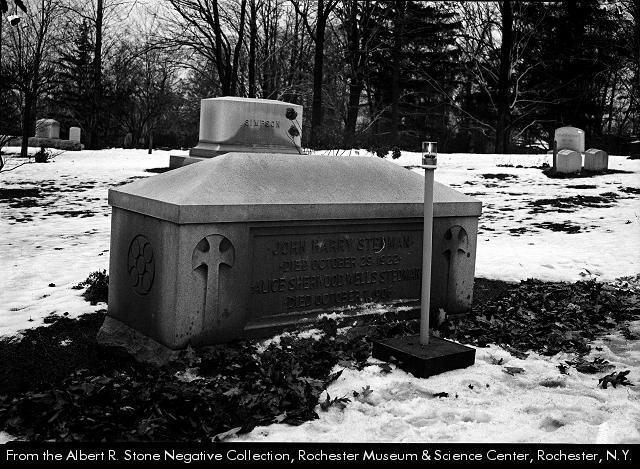 He’s buried here in Mt. Hope Cemetery. I digress. There were also weekly passes. For a buck, you could ride anywhere anytime, all week. The streetcars were pretty comfy, actually. 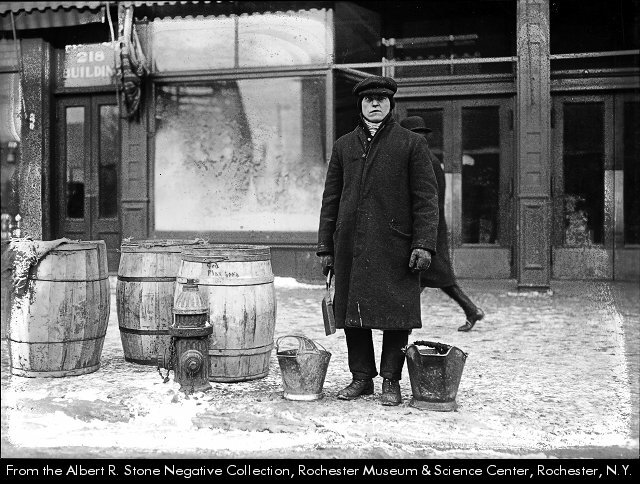 We know this because Mr. Stone photographed their interiors in 1918, as they were disinfected during the influenza epidemic. Take a look. 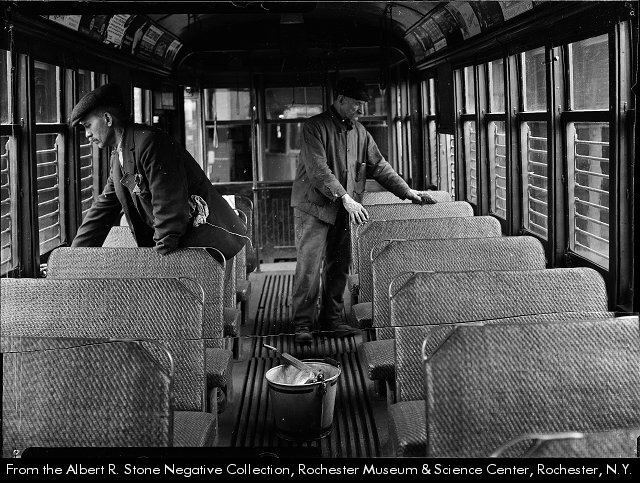 In the winter, the cars were heated by coal-fired stoves. During WWI coal was rationed, so the railway system positioned coal stations across the city where a conductor could get a handful of coal lumps to keep the home fires burning. This guy looks like he is having a real ball. Perhaps I have digressed again. 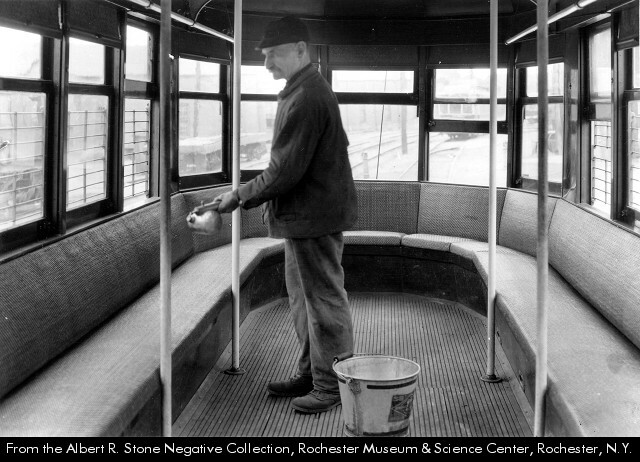 In the 20s, the streetcars ran from 6:00am to 12:00pm – 18 hours a day. But here’s where the comparison to today starts to get a bit, well, revealing. At peak, the headway – the distance between trains – was about 5 minutes. The longest headways were in the evenings, and were about 15 minutes. Today, the bus system runs about 20 minute headways at peak, and off-peak headways sag to about an hour or more. 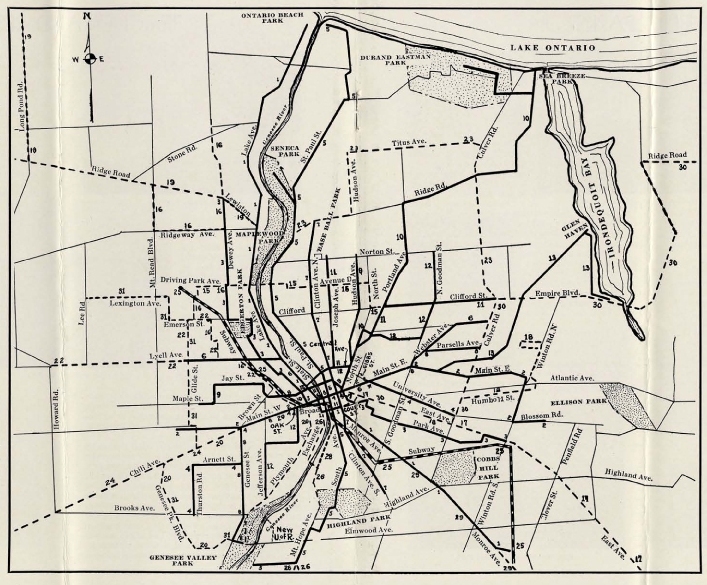 And if you were inclined, there was an interurban between Rochester and Syracuse that ran every 30 minutes. So over 80 years ago, you could move around our city almost as quickly on the streetcar/subway/trolley/bus system as in your car today. Maybe we’re not as smart as we think we are. And you could get to Syracuse, downtown to downtown, from here as fast or faster than you can get there today, in your car. Hmmm. Now, a short glimpse at today’s bus system. Here are a couple of images of the bus routes today. 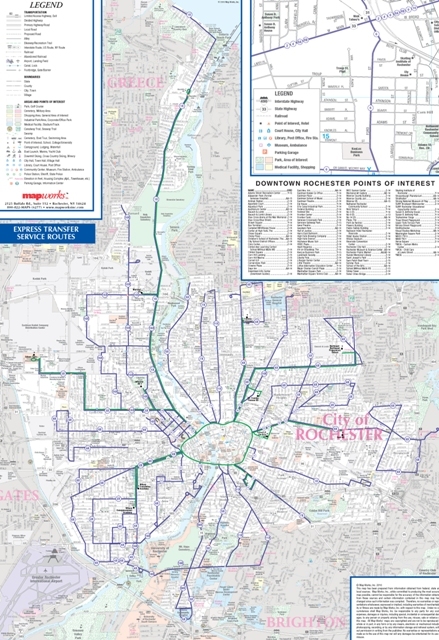 I have taken these from the RGRTA website. They offer a 14mb image of the system map that is pretty nearly impossible to use – slow to download, gigantic, and cumbersome, at best. Come on guys – the 1929 map is a snap to use. Looks kind of familiar, yes? So in 1929, you could get downtown (you wanted to go downtown) quickly, and transfer easily to other parts of the city. Today you have to go downtown (you may want to go there, or you may want to go elsewhere, but you have no choice), usually pay a second fare to transfer to another bus, and go out of downtown to your destination. Lots has changed in our region in the last 80 years. As I said at the outset, we no longer live, work, shop, or loiter in the same places we did then. But here’s the thing: it was a 20 minute city then, and it’s a 20 minute city today. Except that in those times, it was 20 minutes using transit. Today, you are in your car. Is this progress? Maybe. Maybe not.